HUD Assistant Secretary Neal Rackleff served as our Council Chair in 2018. As he transitions out of that role, we sat down with him to talk about the importance of the work ahead. USICH: What from your experience as a Housing Director in Houston did you bring to the job at HUD and at the Council? 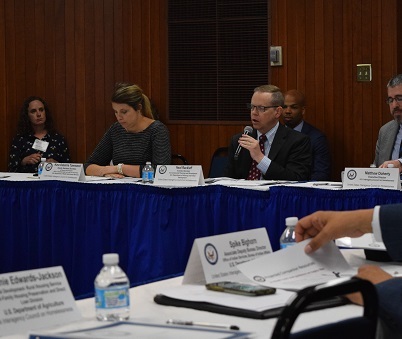 NR: The most important reason I came to HUD was because I have seen the success that HUD, local governments, non-profits, and for-profits have had in working together to promote access to low-barrier housing through a Housing First approach to end homelessness. It’s the most remarkably successful effort in government. I was honored to accept this opportunity to ensure that we continue to do that work. USICH: What have you learned since coming to Washington? NR: I learned that we have a lot of really talented, dedicated, good people in the federal government who are working hard to solve big problems like this. The staff in HUD’s Office of Special Needs (OSN) and the staff at USICH are pretty extraordinary men and women who genuinely care about the people they serve and are working effectively at helping those folks. My job has been learning how to support them as we make smart, data-based decisions to use the resources we have in the most effective ways. USICH: As Council Chair, you oversaw the release of Home, Together, the new federal strategic plan to prevent and end homelessness. What is the importance of that plan? NR: Home, Together is a very good articulation of the responsibility we have in the federal government to continue to move this work forward and improve. It shows that we aren’t making decisions based on anecdotal information—we are following the data to focus on the best outcomes. And because of that, people on both sides of the aisle have come to the conclusion that we are doing the right thing. I truly believe that the success we are seeing in reducing homelessness can be a model for other areas of government. The “democratization” of data is allowing us to be more efficient and effective, and that will only continue to spread across federal, state, and local government. I see the work that HUD, USICH, VA, and our other partners are doing to share data and use it to make sound decisions as a really hopeful development. USICH: What are some of the most important things we need to stay focused on in the next year or couple of years? NR: We need to stay laser-focused on outcomes and continue to refine what we are doing to become more efficient with the resources we have. When I became the Housing Director in Houston, I was told about Housing First as an approach for helping people exit homelessness quickly, including those who had been homeless longest. Well, I’m a lawyer, and a bit of a skeptic, so I said “Where’s the evidence that it works? Show me the data.” We benchmarked with other cities and studied lots of programs that applied Housing First principles. We also examined a lot of data, and it turns out they were right. The best way to help someone who is homeless is to give them a home. And when we learn that it is dramatically more cost effective to do that as well, it all starts making more and more sense. At the same time, I’ve heard folks say that Housing First can’t work for everyone. Remember that Housing First isn’t housing only. The most successful approaches use housing as a platform to connect people to the services or supports they need to stay housed long-term. Whether it’s connecting to a job, getting back into school, accessing treatment for an addiction, addressing a health issue, reunifying with your kids – whatever those underlying challenges folks are dealing with, it’s a lot easier to deal with when you’ve got a stable place to live. I’m a skateboarder. When you are skating a pool, your run begins with dropping in. It’s a pretty simple maneuver, but it’s psychologically daunting. You look out over the nose of the board, and it feels like you are going to fall straight to the bottom. But if you completely commit and lean all the way forward, you’ll cruise down and start your run. There’s a skate park in downtown Houston with a 12-foot high bank. The first time I dropped in, I stood there for a half an hour wondering if I should I do it or not. Then a 13-year old kid yelled at me, “You can do it, dude!” His encouragement gave me the courage to make the drop. We see so many cities and states effectively ending homelessness now because they are fully committed to the approach that works and to building strong coalitions across systems. We’ve cracked the code on ending homelessness. The issue now is amassing the resources necessary to solve the problem. USICH: How are we going to amass the resources? NR: I think it’s important for people to recognize that more money has gone in to initiatives to end homelessness under this administration than any other. But it’s not realistic to expect the federal government to shoulder all of the burden of solving this problem. State and local governments and for-profit and non-profit entities are going to have to become more involved in the solutions. And solving our overall affordable housing crisis – which I think is completely doable – is going to be the best thing we can do to solve homelessness.